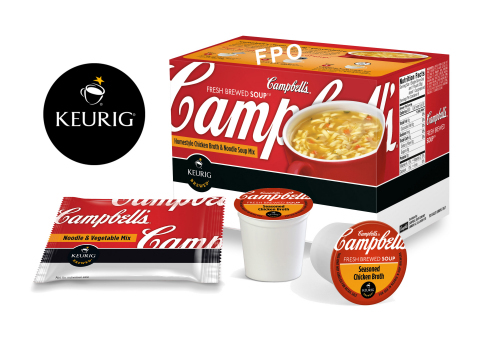 Campbell Soup Co. and Green Mountain Coffee Roasters Inc. today announced an agreement to bring Campbell’s soups to the Keurig single-serve coffee brewer in 2014. Campbell’s Fresh-Brewed Soup K-Cup packs will offer consumers soups that can be prepared at the touch of a button in Keurig brewers. “This innovative partnership is a win for consumers and for both companies, and represents another important step as Campbell expands into higher-growth spaces,” said Denise Morrison, Campbell president/CEO. “Campbell’s is an iconic brand that shares our focus on harnessing innovation to delight consumers – making them an ideal partner as we take this first step beyond beverages for the Keurig system,” said Brian Kelley, president/CEO of Green Mountain. Campbell’s Fresh-Brewed Soup consists of a broth K-Cup pack and an included packet of dry pasta and vegetable blend garnish. Consumers brew a broth K-Cup pack over this garnish to create a snack in minutes. The soups use Keurig's "proprietary manufacturing expertise to seal in the ingredients’ peak flavor, and Keurig’s single-serve knowledge to release an authentically delicious, perfectly portioned snack." The companies plan to launch three varieties of the new soup, including Homestyle Chicken Broth & Noodle, in 2014. They expect the soup pods to be offered in the same aisles and retail sections of stores where Keurig K-Cups are sold. Snacking is a growing behavior among U.S. consumers, with more than half snacking multiple times a day, the two companies said in the announcement. 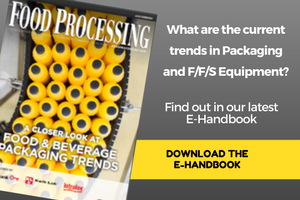 Consumers are also looking for snacks that serve as mini-meals to satisfy hunger, and there is an increasing need for ultra convenient options. "Campbell’s Fresh-Brewed Soup was designed to meet that consumer need," they said.